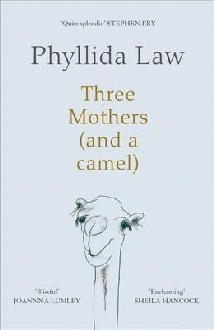 Three Mothers (and a camel) is actress Phyllidia Law’s chronicles about her relationship with her own mother who suffered from dementia, and her caring for her mother-in-law (who was deaf), told from the notes she wrote to her “Gran”. We first read the notes to her mother-in-law, and slowly build up a picture of a hidden, unseen lady who never speaks in this narrative; a narrative of scribbled notes. Over many notes, we read of the cares and concerns of “Gran” who lived upstairs, and her deafness, and her good habits of washing on Mondays, ironing on Tuesdays, cleaning the house on this day, shopping on other days, fish and chips on Fridays; the patterns are those that many mothers would recognise. Wartime rationing burgeons behind much of this narrative as do receipes, cleaning cups with bleach (the tea tastes terrible afterwards), and care of pets: Boot the cat takes central place at one point in the notes with “Gran”, and hints at how important pets can be for the ageing. More touching is the narrative of caring for her own mother spliced with Law’s stage career and gigs. Phyllidia Law is bracingly honest, her efforts to find out about her mother’s dementia (or was it Alzheimers?) engenders fears within herself – until her daughter rings and confirms a wheat allergy, which is hereditary. For all her life – as this story so touchingly tells – Law has been forgetful, harried by details and necessities, locking herself out of the house and forgetting the keys were in her pocket, leaving make-up at home, like this, she had a clear pattern of what appeared to be hereditary … dementia … dare she suggest and fear herself in her own story telling. Laughter is the best medicine, Readers’ Digest often reminded us, and laughter gets Law and her mother through many erratic situations in the kitchen, cooking, kneading dough, going out for walks, like this. Yet, this reads as a touchingly honest, at times searing emotion of caring for mother who is ill and witnessing the descent of a mind into slow, crippling dementia. Law, in all her honesty, reveals that the bonds of love – tough, strong bonds, kept her upright and resilient in the boxing ring in her daily bouts of coping and caring for the one who brought her into this world and slowly becoming incoherent. I found this an insightful read, mothers writing about their mothers, and ladies talk and wartime recipes, how to stretch food when rationing was in place, how people cope with change, and change that brings no meaning nor sustenance. A gorgeous read at times, funny, and sad at the same time. Family life is like this. Family love is like this, also. Phyllidia Law is the mother of actresses Emma and Sophie Thompson, and worked herself as a successful actress. Warm and moving, and enhanced by the author’s own illustrations. I feel this is one of the more important books I have read of late, for many of my friends have had to deal with both dementia and Alzheimers, and we are all living so much longer. To read of coping with such a challenging medical diagnosis in home care told so honestly leaves a very strong impression: of love and its strengths, and of caring in the face of unpredictability.